I love starting my Italian cooking with pancetta and onions! This is a great way to make a traditional Italian Sauce. In a large cast iron pot at medium-high heat add olive oil. Sauté pancetta for about 5 minutes then add in onion and garlic. Let sauté for another 3 minutes. Add in wine and let deglaze the pan. Then add sea salt, pepper, crushed tomatoes and diced tomatoes. Bring to a boil. Add in tomato paste and stir to dissolve. Lower heat, cover and let simmer for 20 minutes. Remove from heat and let cool. 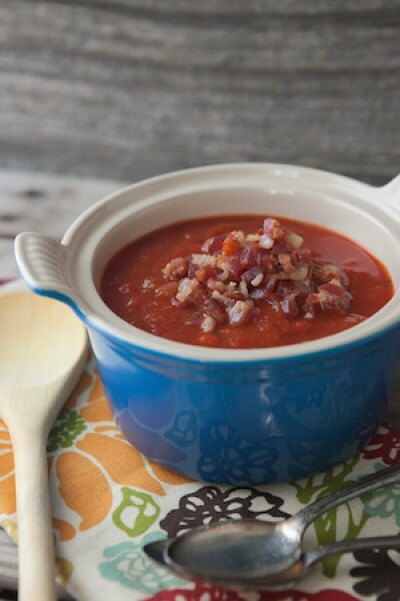 Using your emulsifier; place into the sauce and puree the pancetta and onions until the sauce is smooth. Once done add in oregano, stir and taste for other seasonings. Simmer until ready to enjoy. Note: You can also use a blender but you may need to process in batches!